Try This! is going to be a little bit…unique today! Usually Try This! will be more of a Haul/Product Review piece, but today I’m going to be reviewing my experience getting a tattoo at Mainland Ink with my best friend Katie. Disclaimer: Getting a tattoo is a HIGHLY!!!!! personal choice that requires thought & planning. I am in NO WAY saying that you should run out & get a tattoo at Mainland Ink or anywhere else. I am simply sharing my experience & the thought process behind our piece. If you have any questions/comments/concerns, please feel free to leave them in the comments below! Also below, check out a quick video of Katie & me in the tattoo process! I’ve known Katie since high school where we caused much mayhem & mischief together as cheerleaders. Being on the same team, we obviously knew each other & were close, but my Junior year we were co-Captains of our team & the rest is Best Friend/Soul Sister history! The tattoo is, from left to right, the Alchemical symbol for Air (Gemini is an Air sign), the Gemini symbol, & the Deathly Hallows from Harry Potter. Another best friend, Marcela, pointed out an alternative interpretation that Katie & I are equally happy with – it could be all Harry Potter related with the symbols standing for the Sorting Hat, the Time Turner, & the Deathly Hallows. Katie has a few tattoos already, whereas I’m a novice to the game. I have one other tattoo which I’ve kept under wraps because it’s not finished yet. We had been talking for a bit about getting something matching but never seriously pursued the idea because I didn’t have any tattoos yet. However, after I got my first tattoo the idea of doing something together became way more real so we started planning. We’ve always bonded over the fact that we’re both Gemini, her birthday is June 1st & mine is the 7th. We also are both huge Harry Potter nerds. The piece is special because it appeals to us individually yet also references interests we share. I’ve wanted a Gemini tattoo since I was in high school because I’ve always felt it was so spot on in describing my personality. Also, my dad had his sign tattooed on him, & in a weird turn of events, the tattoo artist was named David (my dad’s name) & we got the tattoo on the anniversary of my dad’s passing so it all felt very…spiritual & a way for me to connect with him. We decided to place the tattoo on our foot for practical & “meaning” reasons. Practical – We’re aware that tattoos in the workplace are still not totally welcome so we wanted to make sure it was something we could semi-easily hide. My other tattoo is on my side, so I couldn’t watch it being completed. Being able to watch was quite a different experience! The pain is about the same, at worst it’s like a sharp pinch. One weird thing that happened was when the needle hit a certain…nerve/muscle/tendon…? my foot would twitch. I was holding my leg down because I was afraid the motion would ruin the lines, but it turned out basically perfect. There are a couple minuscule wiggles but they are SO hard to notice, you literally have to be nose to foot. David asked if I wanted him to go over the lines again, but I said no because its hardly noticeable & we were both concerned that more touch ups would run the risk of more twitching & henceforth more wiggles. “Meaning” – Being a Gemini, our connection to HP, & our connection to each other are what makes us who we are, it’s our roots. Placing the piece on our foot symbolized that roots/ground idea. Positives: The shop was clean, comfortable, has a great rating on Yelp, & they were able to work us into the schedule, even staying late two nights in a row. Everyone we talked to (Ozzy, David, & another guy but I didn’t get his name – sorry!) was really nice & willing to work on the design & placement with no attitude. They treated us with equal amounts of respect even though I’m a newbie & Katie has more tattoo experience. This is important to me because my first tattoo artist seemed annoyed by my questions or when I wanted to adjust the placement/stencil. I felt like she wanted me to just do what she wanted because I didn’t have any tattoos & she did. I’m still allowed to have an opinion about what goes on my body! This was not the case at MI & it was greatly appreciated. The shop minimum was on par with what I expected. Negatives: Communication was a little weird. I emailed our design & inquired about pricing/availability. No answer. Later that night I called & we ended up stopping by. We were told Ozzy would call the next day to set up a firm appointment time, but by late afternoon we hadn’t heard anything. I called the shop & Ozzy said he was planning on calling when he had a bigger chunk of time between clients. I understand he’s busy but we were starting to stress & wonder if they even wanted our business. At the shop we’re eventually told David will be doing our tattoos – what?! Who?! He didn’t have any examples of his work to show which made me extremely nervous. Thankfully we had a pretty simple design because if we had been doing anything more complicated I wouldn’t have let him tattoo me. In regards to Mainland Ink – If you’re looking for a Tattoo Parlor, yeah! Mainland Ink was great! Other than the communication issues, everything was awesome & I would recommend this shop. I’m beyond obsessed with my tattoo, I can’t stop looking at it, & am so excited to show it off! DIY Tutorial: Decorative Headband Holder! 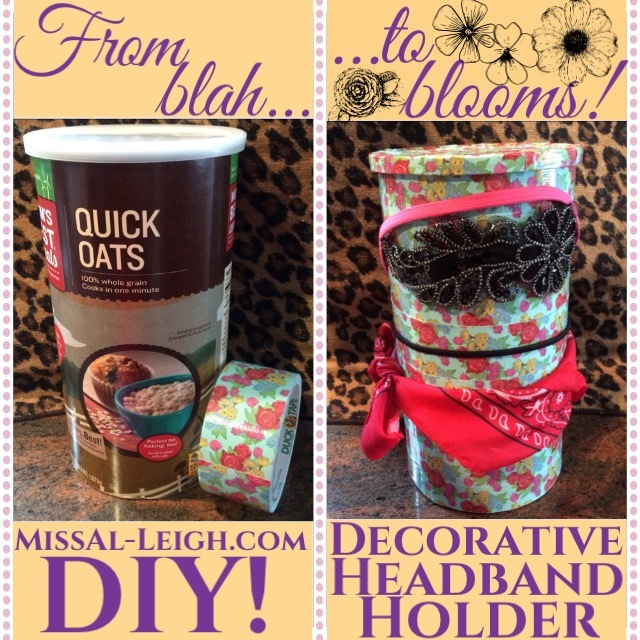 Today I’m doing a DIY Tutorial that will show you how to turn an Oatmeal container into a Decorative Headband Holder! This is a really super simple version of those more complicated tutorials you may have seen on Pinterest. My tutorial doesn’t require fabric, card stock, or any kind of glue. 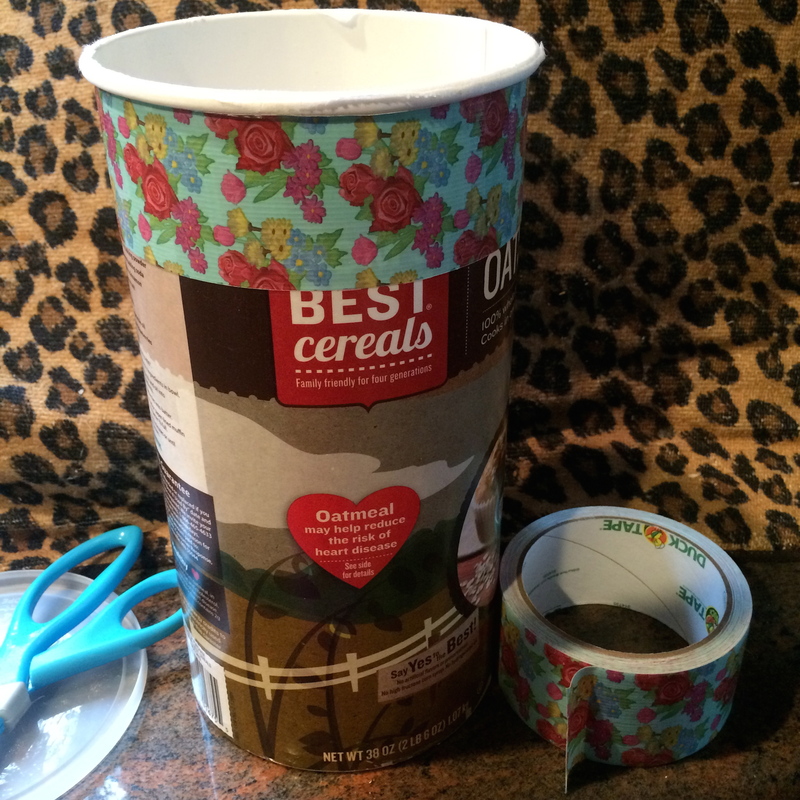 All you need is an empty, cleaned out 38 oz container of Oatmeal (or smaller if you’re crafting for a child), scissors, & duct tape in your preferred pattern/print/color! This project is great for beginning DIYers, busy bees who don’t have a lot of time, those working with limited crafting space or crafting on a budget! As this is a pretty easy and safe craft – be careful with the scissors! – I think this would be a good project to do with crafty kiddos. I can see myself taking my little cousins on a trip to a craft store to pick out their favorite tape & spending some time crafting. My basic Tutorial is very simple & allows for a lot of trial & error. If you make a mistake, rip the tape off and try again! If your container gets bent out of shape, take the lid off & pop out the dent! However, if you’re looking for something more, I’ve included some tips and tricks throughout that will help you spice this DIY up a bit! Let’s get Crafting! Start wrapping the tape around horizontally, wrapping as you go. Cut the ends instead of tearing for a cleaner look. Start by cleaning your Oatmeal container. I put the oats in a large Tupperware & dusted out any debris. 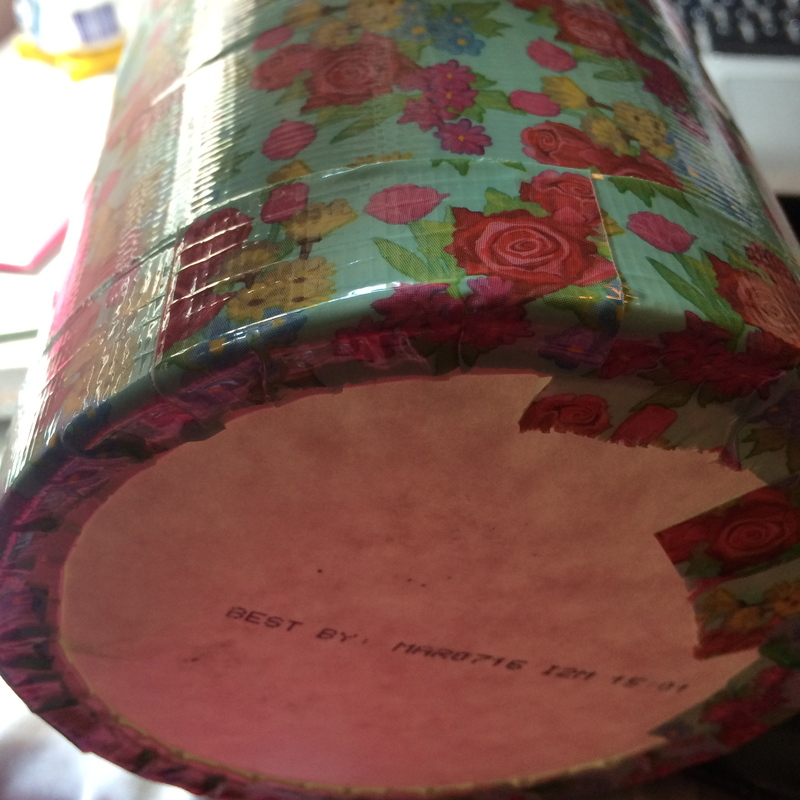 I chose to start my tape alongside the seam of the container. Working in horizontal sections, wrap the tape around, as pictured. I worked one section at a time, pulling the tape as I wrapped rather than measuring or estimating how long each piece needed to be, but it’s up to you. I chose to overlap the pieces sometimes or start the sections in other areas to make the flowers match up so I didn’t create a uniform seam going vertically down. You can choose to line the tape up perfectly, but I don’t think that’s necessary because, really, who is looking that closely!? Most of your headbands will cover up the tape lines. If you’re using a less busy pattern, like maybe a chevron print, it would probably be more beneficial to match everything more closely as it will be more obvious if your rows disturb the pattern. On the last row, I worked in smaller vertical sections to fully cover the base. As you can see it took me a few tries to make all the pieces the same size, but no one will see, so it doesn’t really matter. I covered the overlapping pieces with one last horizontal taping & the container is finished – next up, the lid! I was considering leaving the lid bare, but the plain plastic just looked so odd in comparison to the flowers. I secured a small piece of the tape under the lip of the lid, folded it up, then down onto the top. Again, this took me a few tries to get all the same size, but it doesn’t really matter because you’ll cover it up. I covered any remaining plastic in sort of a patchwork style. I wasn’t too precise with this either because I’m pretty sure I’m going to find something to decorate the top with & mostly cover the tape, but I’m not sure what yet. There you have it – that’s it! I attached a few headbands of different types so you could get an idea of what this Headband Holder can do. I will most likely be making another holder so I can separate stretchy “gym” type headbands from the more standard non stretch type. Did you enjoy this DIY Craft Tutorial? I think this is so fun & easy! It would also be really simple to spice this DIY up a bit by using E6000 Permanent Craft Adhesive or a hot glue gun and attaching a decoration to the lid, or securing the holder to the center of a cake plate for a fancy base. Now that I’m thinking about it, you could create this same project, punch small holes down the side, insert pegs, and voila! – you just made a stand to hold multiple pairs of sunglasses. Or cover up a large gum holder like the Mentos containers, and use it to hold bobby pins/hair ties, or just have a fancy gum holder! Hmm…the wheels are turning! What do you think of any of the ideas I listed above? Will you be trying out this DIY project? Please let me know in the comments below or tag me on Instagram/Twitter: @missal_leigh so I can see your finished product! Click the FOLLOW button on the top right to get an email notification when I write up my next DIY Tutorial – thanks for reading!